We all know the “If you’re happy and you know it lap your hands” song and this dinosaur wants to do that to. But unfortunately this T-Rex only has really short arms so he can’t clap his hands. You wonder if the dino is being made fun of while trying but it is kinda sad in a funny way. And now you can have all that on a fun t-shirt including the text “If you’re happy and you know it clap your… oh..” and of course a picture of the dinosaur. This T-Rex t-shirt comes in all kind of color and in sizes Small – 2XL. 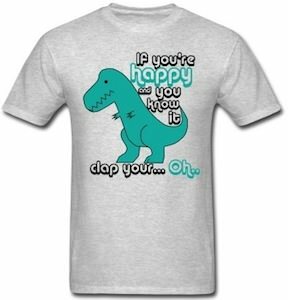 Have a good laugh while wearing this T-Rex Clap Your Hand T-Shirt.